What’s the difference between peas and beans. Each year during the first few warm days of spring we get people coming in looking for plants. People coming in offering us money is always a good thing (especially after the long hard winter!) but often the notion of appropriate plants for cold weather (and soil) vs. warm weather (and soil!) is not at the forefront of their thinking. Plants come in all shapes and sizes and they also have variable requirements when it comes to temperature as well. To get back to the example of peas and beans. The seeds look a bit alike (at least in terms of size). They are both legumes and produce pods with multiple seeds that you harvest to eat (or plant). They must have the same requirements then right?…well of course you could see this coming but the answer is no. Peas will readily germinate in cool soil so can be planted as soon as you can work your garden. They also don’t like the heat so if you don’t get them planted early enough the heat of the summer will be very hard on them. Beans on the other hand require warm soil to germinate and if you plant them with the peas in April will simply rot before the soil warms up enough for them to germinate. Even if they do germinate if we get any cold weather they will be decidedly unhappy and if we get frost it will kill them. A short list of pea type crops both flowers and vegetables are; lettuce, cole crops, petunias, pansies and dianthus. A short list of bean type crops are; tomatoes, peppers, eggplant, impatiens, begonias and geraniums. All the bean type crops will at best sit tight if the soil and air temperatures are not warm enough and at worst rot in the ground. If you are ready to feel the sun, the rain, the earth and be overwhelmed with the choice of plants then come to see our greenhouses. For several years we have been a source of sweet potato cuttings. This year we are also selling seed potatoes. We have found an excellent source of certified seed potatoes in Squirrel Farms Seed Potatoes….that’s a surname not the workforce! They were great people to order from and many thanks to Jeff Klug from Root’s Down Organic Farm for picking them up for us. Here is a list of the varieties with a brief description of each one. Deep purple skin with purple flesh. High yields of large oblong tubers with consistent dark blue-purple flesh that hold their colour when cooked. High in antioxidants. Deep red skin with red to pink flesh. Oblong tubers hold their red color when cooked and are high in antioxidants. Resistant to hollow heart; moderately resistant to common scab. Brilliant red skin with bright white flesh.Good flavour with creamy smooth texture. Regular spherical shape. 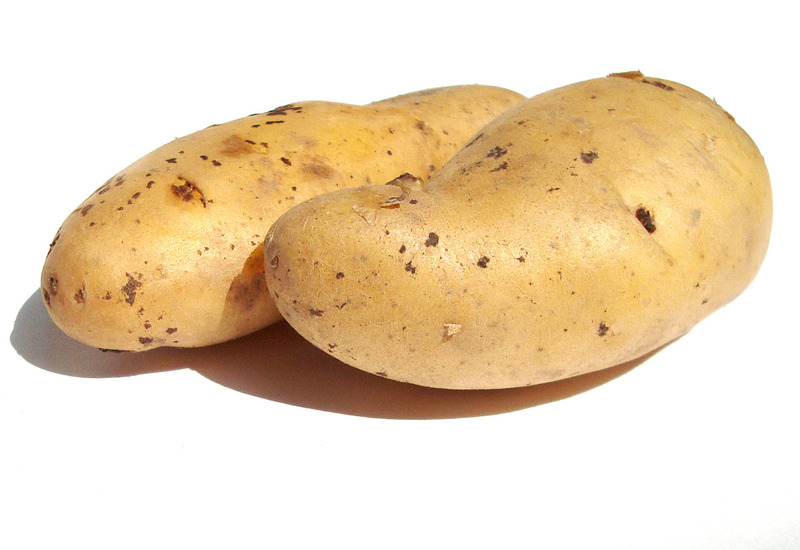 Medium-large russeted tubers with dry white flesh that store well and are suitable for baking and frying. Resistant to hollow heart; moderate resistance to verticillium wilt, blackspot, and scab. Excellent flavoured in an early potato. The traditional favourite early potato for home gardeners. Very popular for its distinctive taste and dry, creamy, white flesh that boils and bakes exceptionally well. Medium sized, round potatoes. Bright red thumbs with light pink flesh. Very productive. Late-season fingerling heirloom variety that is highly regarded for its uniform size, disease resistance and storage qualities. Standard early season round white. A late yellow fleshed Yukon cross. Scab resistant and yields well. Mid season yellow fleshed variety. Considered the best tasting yellow variety. Scouting is one of the hardest and most interesting jobs in an IPM program. The role of the scout is to systematically exam periodic blocks of plant material, assess the population of pests and beneficial and note the general health of the plants. The most important skill that I have found is the value of remaining still. If you keep moving your eyes around it is often difficult to see something small that is moving. If you keep looking at one spot then often something will appear and can move into your field of vision. If something appears on the periphery then you can shift your eyes to that position and then re-focus. Patience is an absolute necessity. Naturally with time you will learn the spots that are most likely to harbour the pests or benenificials. For instance thrip like spots that are cryptic. You will find them inside the depths of a flower or inside an unfolding young leaf at the growing tip. So after scouting a greenhouse yesterday my count was, 3 Amblyseius cucumeris (thrip predator), 1 Hypoaspis aculeifer (soil dwelling thrip predator), countless Aphidius colemani (aphid parasite) and many springtails (small, harmless soil dwelling insects). One thing that I scouted was a small fly, orange in colour with brilliant red eyes, striped abdomen with a dark tip and hardly any antennae. I had thought this creature was something called Eretmocerus eremicus. All last season I had identified him as such but this year he showed up before I had introduced any (Eretmocerus). When I looked more carefully at him it was clear that he was not Eretmocerus. They were congregating on the aphid banks so may be an aphid predator but after a couple of phone calls I still could not identify him. He has very active predator like behavior. So if someone out there is missing a pretty red-eyed fly please let me know! We have now been growing garlic in a hybrid system, in our greenhouse to winter and moved outside to finish growing in the spring, for 5 years. A benefit of this is that the boxes we grow the garlic in are filled with high quality soil and and have fewer weed seeds than most field growing. We take advantage of these conditions to grow out bulbils. More bulbs forming (rather than rounds). Larger rounds and or bulbs. 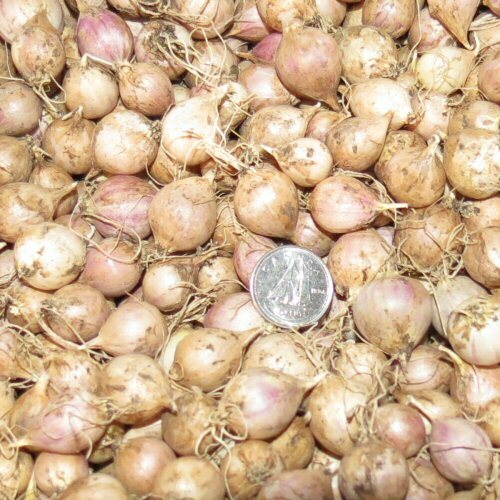 We have found that from the porcelain varieties that we grow the “medium” size rounds which make up about 70% of the rounds that are produced from bulbils in one year, make almost 100% bulbs and the bulbs are of a completely acceptable size for planting or eating. So why would you want to plant rounds instead of cloves? Short of tissue culture bulbils are the best way to grow disease free garlic and by planting rounds you are much closer (1 or 2 generations) away from bulbils. Our garlic crop before moving outside. Click here to buy garlic now. A broken record yet again, for the record! Of course my kids are use to this. There goes Dad again but I can tell by the look in their eyes that they are appreciative of every word. Some of the confusion around watering stems from the fact that water can be both a limited resource and a damaging element. As everyone knows (like my children) I strongly believe that people must learn to judge when the plants need water before they apply water and the application can not be done on a schedule. If plants are under-watered (scarce) or over-watered (damaging) the result is the same …. root death. Once roots have been damaged it takes time for the plant to repair and regrow new roots to support its top growth. In the summers it is often a time of scarce water resources. In the city all water must be treated and unfortunately the water going on your garden has had expensive limited resources used to make it fit to drink and sometimes the demand outstrips supply. In the country most people will be on wells. Often the aquifer that the well is tapping into is limited in supply and as the summer progresses water levels will drop and yet again you are using valuable drinking water to water your garden. A partial solution to this is proper water management from the beginning. When you first establish plants you want to water them in very thoroughly saturating the soil in their near vicinity. This will serve to wash soil into the voids around the roots leading to the best soil/root relationship. After that you want to allow the soil to dry out until just before the plants starts to be stressed by lack of water. At that point the roots will not be damaged and they will have grown as vigorously as possible looking for more water creating a more robust root system. What do you next?…repeat. What will happen is the time between waterings will increase as the root system expands. As the summer progresses you will be able to restrict your watering hopefully until you don’t need to water any longer. Listening to the radio today I heard something about an “App” available from an organization called Buycott. One of the primary functions of Buycott is to allow the identification of a products “family tree” from scanning the product. The family tree is made up of the company that made the product and its relationships to its parent companies etc. So in the same vein as Buycott and the interest of transparency I would like to admit that Burt's Greenhouses is owned by Brian Burt and Ruth Hayward. Its relationships to any other parent company does not exist…the buck stops here! A further confession is that we are using replacement workers. We have drawn these workers away from their native lands to work at Burt's Greenhouses. They have come from Toronto, Ottawa, Napanee, Kingston, Yarker and from as far away as the UK! We hope that leaving their families to come to an exotic land has not resulted in too much hardship. And lastly we would like to acknowledge that we could not have made it through the season without the help of those workers. Thanks!…..Lora, David, Alex, Nyree-Dawn, Carolyn, Anita, Colleen, Hanna, Sarah, Emmy, Hayden, Amanda, Colin and Snapdragon. Ok so in honour of the Open Voices singers who came out the the greenhouses to sing for and hour on the Saturday of the long weekend…..the "Wilton Tabernacle Choir" was formed with sponsorship of Burt's Greenhouses. Remember this is the first public performance which will surely bring us all the attention we deserve! …and in case you missed the performance of Open Voices singers on Saturday. 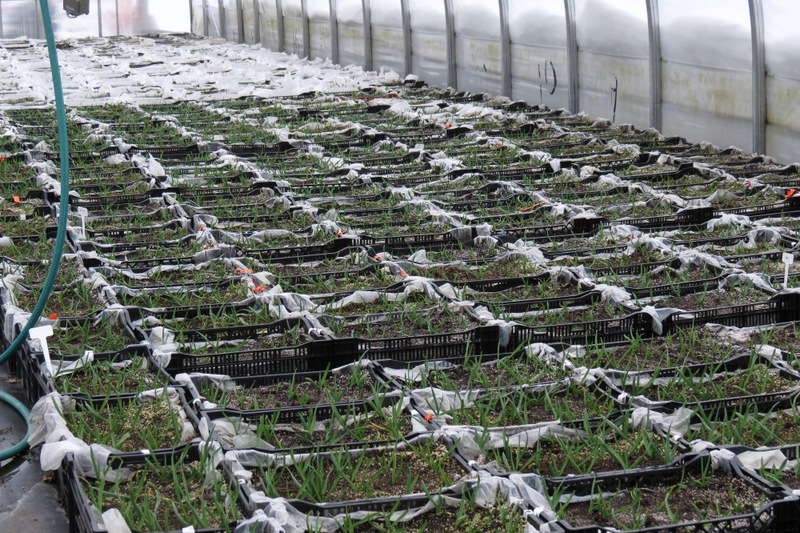 For the past three years we have been experimenting wth overwintering a garlic crop in our greenhouses. We do so in the greenhouse that houses our overwintering perennials. It is kept heated to maintain a temperature of about -5C so that everything freezes but does not get exposed to extreme cold. In addition to a normal crop grown from cloves we have produced bulbils. These bulbils will develop into normal bulbs over the course of succesive plantings taking up to 4 years to do so. In the years leading up to them producing normal segmented bulbs they produce rounds. The rounds are normally smaller then a clove of garlic and until they reach the proper stage won't be segmented into cloves. It is all quite fun although I have to admit that Ruth planted everyone of these boxes in the fall!…..so I guess she had most of the fun . Our next step is to go through the boxes and do any weeding (very little) and them move them onto the outside beds to grow on to maturity. Stay tuned to get your garlic scapes!